The Council on American-Islamic Relations (CAIR) announced Monday that Democratic Michigan Rep. Rashida Tlaib will be speaking at CAIR-Michigan’s annual banquet only days after the Hamas-linked organization revealed that fellow Democratic Rep. Ilhan Omar of Minnesota will be speaking at CAIR-LA’s annual banquet. CAIR is a notable pro-Palestinian organization with ties to Islamic terror groups. The U.S. Department of Justice listed CAIR as an unindicted co-conspirator in funding millions of dollars to the terrorist organization Hamas. Additionally, the United Arab Emirates (UAE) named CAIR a terrorist organization along with al-Qaeda and the Islamic State in 2014. Tlaib will be the guest speaker at CAIR-Michigan’s 19th annual “Faith-Led, Justice Driven” banquet on March 17, according to the organization’s invitation. Single tickets start at $50 per person and a table can cost upwards of $500. Tickets for Omar’s March 23 event start at a similar price point. 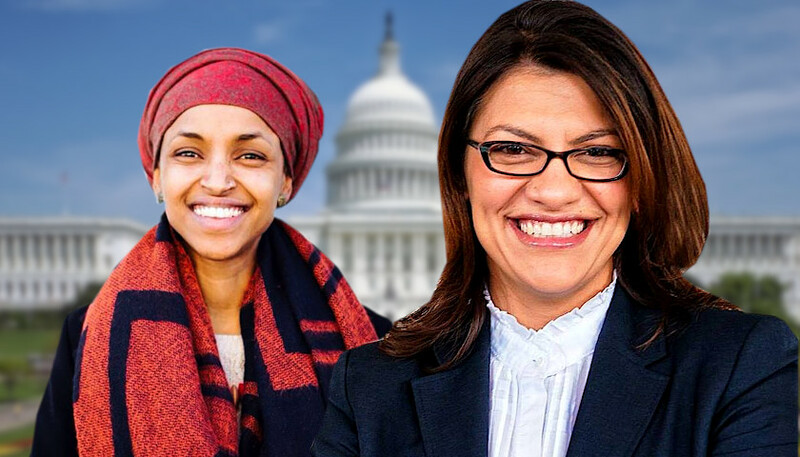 Omar and Tlaib became America’s first Muslim congresswomen when sworn into office in January. Their time in office has been embroiled in allegations of anti-Semitism. Tlaib invited a pro-Hezbollah, anti-Israel activist to her swearing-in ceremony and the following private dinner in January. Days later, an op-ed column she wrote in 2006 for Final Call, a Nation of Islam publication founded by Louis Farrakhan, surfaced. She also has come under scrutiny for having ties to other anti-Israel individuals and for questioning the loyalty of Republican lawmakers who support the Jewish nation-state. Omar has defended anti-Israeli statements, such as ones invoking Allah to expose Israel’s “evil doings,” and she is on record implying Israel is not a democracy. She gave an interview to a host that referred to Israel as the “Jewish ISIS” and mocked how Americans speak about al-Qaeda and Hezbollah. BDS has been metastasizing through college campuses, initially promulgated by Students for Justice in Palestine (SJP), the movement’s most visible arm. SJP has been linked to the Islamic terror group Hamas, according to The Washington Free Beacon. Moreover, the U.S. Campaign for Palestinian Rights, the American umbrella group of the BDS movement, has reportedly given money to terrorist organizations like Hamas, Islamic Jihad and the Popular Front for the Liberation of Palestine. Molly Prince is a reporter for the Daily Caller News Foundation. Follow Molly on Twitter. Photo “Ilhan Omar” by Ilhan Omar. Photo “Rashida Tlaib” by Rashida Tlaib. Commentary: Was Robert Mueller Colluding With Russia? Very well said. Are government is a joke. Congress are the biggest damn crooks. “Our” but I do agree our government is a joke. Sounds like treason to me! These 2 women are gonna do all they can to bring America down and allow Muslims to run our country. God help us. God, not allah. Wake up America!! Vote, get your family, friends and neighbors to vote in the next election to stop these anti-American people from getting into office again! LETS GET THEM OUT OF OFFICE NOW!!!!! That would be the last thing to say! Sorry we need him more now than we have ever needed him!!!!! Well we know how that goes with democratics. Yes great idea . Plain treasonous…. That is all I got! Should be tried as traitors. If they hated this country send them to their homeland! kick them all out of politics. what happened to born citizens can only run? Only applies to President. At one time a vast number of Americans wanted Bob Hope to run. He had been born three weeks before his parents immigrated to the U.S.. They wanted him to be born on a U.S.ship on the high seas. Because his mother was pregnant, British authorities would not allow her to travel. Muslim’s lie in order to fool and get into our system. They are already here and unless something is done they will continue their promise to take over. I agree. They must be tried for treason. We should contact our Representatives in DC and tell them to have these women impeached and tried for treason..
Is this United States of America government actually going to allow them to fund raise in our country for a terrorist organization to kill us and probably Israelites and others? I know they already had their fundraisers. Have they already given the money to Hamas in order to kill us? We can’t allow this to happen. Do something someone in our government. Wake up Congress get those Muslims out before it’s too late. Our country is being taken over by the Muslim radicals in the name of Allah and what other names they have for their selves. Raising money for them to sneak in is a crime against America. They should be kicked out of Congress and banned from public office for supporting terrorism. Enough. AMERICA has been too nice to all these countries and to repay us for our kindness they are trying to get Shari law here. If you are a true American you better start paying attention to what’s going on because your C hildren, Grand Children & Greatgrand children will not have the freedom that our forefathers fought and died for. Also for the Freedom we freely have now. PRAY, PRAY, PRAY. If we could do that, Trump would already be gone… To prison. Remove these scum now or face the consequences later ! They are the enemy of the United States. What in the hell are our leadership doing ? Are they all completely insane ? It’s not leadership , it’s the uninformed voter who gets them elected into office. What has to be done legally to remove these two women? And one other fruit loop also? The house members themselves could expel them but that would require spines. Hates Israel, however, since WW II they have learned to control their threats to existance. If you help raise mony for a terorist organization are you not a part of it? I think you are. Sould be treated the same as the man who throws the bomb. This is flat out treason. Aid and comfort. Pretty plain English. Hang ’em high. I just googled the Phrase “ Is CAIR trying to impose Sharia Law in USA. It says CAIR condemns Islamic Terrorism. CAIR supports the constitution of the USA and does not support suicide bombing and the killing of people who are not Muslim . However, I don’t like that these women do not support our President. They can all disagree behind closed doors. It they have to speak as a unified unit. They are undermining the security of USA but not uniting with our president . Bless you heart!! I am an old country gal, and this is beyond any logic. Google what is CAIR. check out the different answers and remember, in the Muslim Bible they are encouraged to lie to infidels (anyone who is not Muslim) to advance their religion and to kill those who don’t convert. Can you trust the media? Cairo is corrupt organization funded by the corrupt sgaiter billionaire George Soros. His organization’s have plotted to bring down the government of several countries. He also funds several obama underground Trump hating groups that aspire to bring down Presidet Trump. Most freedom loving Americans believe Soros should be deported. A radical troublemaker. Seems they are sucking you in also with their lies and deceit. America you asked for this! Martin, not really, half of us voted for Trump. Sadly the illegals and dead people voted the two Muslims in office.. and any others who are not worthy to be citizens.. Absolutely not. Obama did this to us by force and the Democrats are still doing it. I thought that was precisely why their Muslim majority districts got them into office – to further political jihad. I’d say they’re doing their job well! This would be AIDING and ABETTING an enemy of the US and is tantamount to TREASON and SEDITION. Punishable by firing squad. How quickly we forget,, after we promised those who died during the 9-11 attacks that we would never forget. These women need to be removed from our congress! They were elected under false pretenses and only have doing harm in their heads! Need to get rid of them before it’s too late!!!! STOP THIS ANTI-AMERICAN, JIHAD INCITING CRAP!!! FOR CRYING OUT LOUD…NO OTHER COUNTRY WOULD CONSIDER LETTING ENEMIES OF THE STATE, COUNTRY, DO THIS CRAP!!! REMOVE THEM FROM OFFICE NOW!! THESE ARE TREASONOUS ACTIONS!!! I just wanna say that if the terrorist would just smoke some schrubbery they’d stop all this blowing up crap crazy stuff. Sit down & smoke some wompam it’d all be okay! Ya know what I’m saying? Former head of the Tennessee American Muslim Advisory Council Zulfat Suara supports Rashida Tlaib and CAIR, whose intent is to bring sharia law to the U.S. Ms Suara is also running for Nashville Metro Council as a Member-at-Large. Political Islam is coming on strong in Music City and its tentacles reach deep into the halls of the TN legislature. CAIR doesn’t want to bring Sharia law to this country, they support the Constitution. Your lying. They are too smart for jokes, they are serious an awful lot of people talking are just blowing hot air. If you believe thaI there is a bridge in Brooklyn that is for sale. Yes, Political Islam is coming on strong all the way across America. Study the following site; https://www.jet-pac.com/. NB, CAIR co-published JETPAC’s 22 page analysis of the 2018 election results. Many Muslims were elected in November 2018, including 7 judges. How would you like to appear before a judge sworn to support Sharia?